Virgin Galactic's mothership WhiteKnightTwo made her maiden flight on 21 December 2008 following several weeks of taxi tests. This is the plane that will carry SpaceShipTwo, with two pilots and six passengers, up into the atmosphere on the first stage of her journey into space. At around 16 kilometres up (50,000 feet), the suborbital spacecraft will separate from the mothership. She will fire her burners, in a rapid and powerful acceleration taking her in a few seconds to three times the speed of sound. SpaceShipTwo will climb to a height of 110 kilometres. That's above the 100-kilometre Karman line, used to define the boundary of space. As she reaches the peak of her run, the rocket motor will be switched off, to give the passengers a period of about six minutes of weightlessness. They will be able to release themselves from their seats and float around the cabin and across to the windows to see the curve of the Earth below. To re-enter the atmosphere SpaceShipTwo folds up her wings to feather them, then returns them to their original position to glide back onto the home runway. The technology is derived from Burt Rutan’s successful SpaceShipOne, which flew into space and into history on 4 October 2004 when it won the 10 million dollar Ansari X-Prize. Rutan’s craft was the first private manned vehicle to go twice about the 100-kilometre line within ten days. The pilot was Brian Binnie from Scotland. The technology was taken up by Richard Branson and Virgin, who now have an exclusive licence from Rutan’s company, Scaled Composites. The project involves the development of a range of technologies. WhiteKnightTwo is the world's largest all carbon composite aircraft, the width of a B29 bomber. The carbon structure reduces weight and assists fuel efficiency: Virgin Galactic say that the new plane will use 50% less fuel than a conventionally-built aircraft. 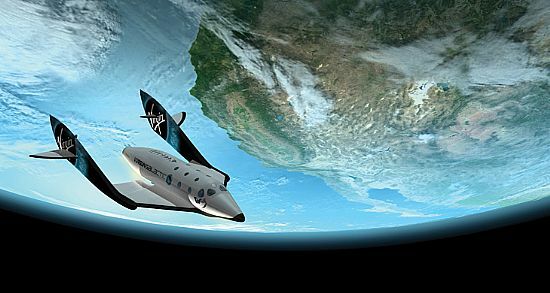 The Virgin Galactic concept goes back to the winter of 1996, and a conversation in Marrakesh between Sir Richard Branson, Will Whitehorn and astronaut Buzz Aldrin. They were waiting for the weather to clear for Branson's round-the-world balloon flight. He asked why the American space programme never launched craft from air– from for instance a balloon? 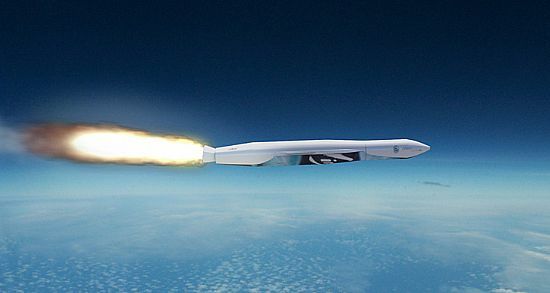 'In 1999,' recalls Whitehorn, 'we decided to register the name Virgin Galactic, not knowing where we'd find a spacecraft. 'In 2003, Steve Fossett and Virgin cofunded the Virgin Atlantic Global Flyer, a plane Fossett would use to circumnavigate the earth on a single tank of fuel, setting a record. I was watching Burt Rutan of Scaled Composites build the flyer, and noticed he had a small spacecraft in the corner of his factory – it being the ship that Paul Allen was funduing for the X prize. Space tourism looks like being one of several elements in Virgin Galactic's corporate model. They're also speaking of space science and space cargo. 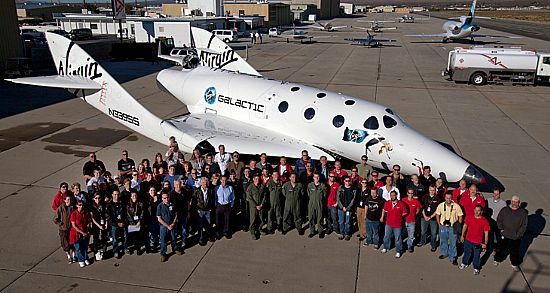 The company say that SpaceShipTwo was designed with enough room to carry out experiments in areas such as gravity research. In addition they are looking at an additional vehicle to be launched from the WhiteKnightTwo mothership. This would be SpaceShipThree, an unmanned two-stage satellite launcher which could put a 200 kg satellite in orbit. And looking further ahead, the company are said to be looking at the idea of using the technology to develop a space plane that would climb up out of the atmosphere for its journey. It would revolutionise the travel industry by drastically cutting flight times: two hours for London to Sydney. In the meantime, as 2009 progresses, WhiteKnightTwo will continue with her test flights. And at the end of the year SpaceShipTwo will be unveiled – to be named the VSS Enterprise. The flight tests are taking place at the Mojave Spaceport in California, and the actual flights will operate from New Mexico, where Spaceport America is now under construction. 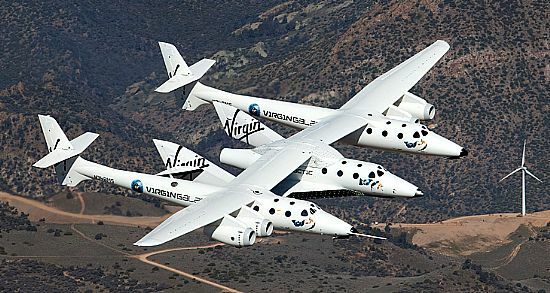 The company plan to have a fleet of two WhiteKnightTwo motherships and five or more SpaceShipTwo tourist suborbital spacecraft. Once the operations are under way in New Mexico, the company plan to spread out to other parts of the world, and they say that RAF Lossiemouth looks particularly suitable. There is certainly a strong Scottish link to the story, with Brian Binnie taking SpaceShipOne to the Ansari Prize, David Mackay test-piloting WhiteKnightTwo, and Will Whitehorn the Virgin Galactic president. It would a great day for their native country to welcome all three to the inaugural Virgin Galactic flight from Spaceport Scotland!